It’s a bonus year; the plum that turned out to be an apple fruited for the first time (see The approach of Autumn) and the plum that we planted to replace this also fruited. 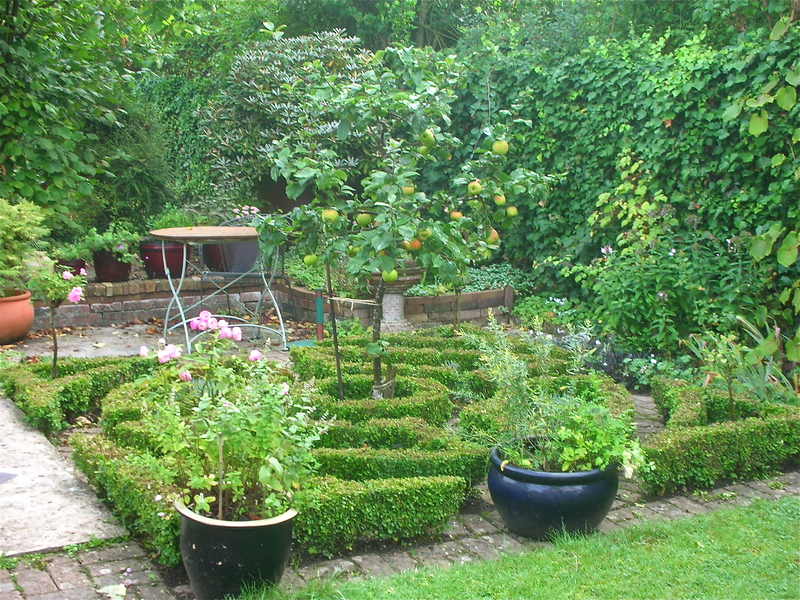 In fact it overdid it and I should have stripped half of the plums off in early summer. We have had several colander’s full already. The weather has jumped from August straight into October, with gales, hailstorms and temperatures barely in double figures. The remaining tomatoes are very unhappy. Last week while I was having a writing hiatus, it was too miserable to work outside, so I started ambitious insulating projects in the house. 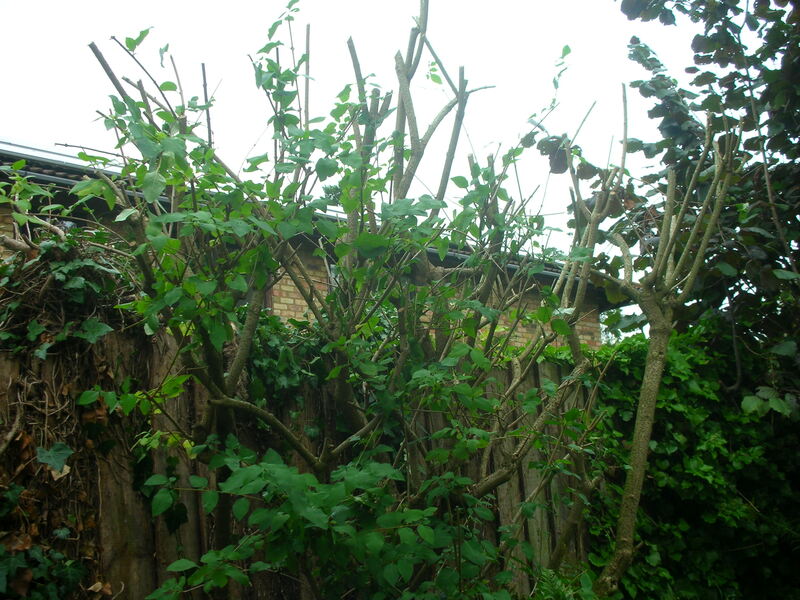 However a break in the clouds sent me out and I spent some spare energy taming an old Forsythia hedge. I may have overdone this a trifle, but it was completely covering the bed beneath. I have to admit it is looking very unsightly now. Never mind, it will get up and go again next spring. The dwarf Blenheim Orange that we planted several years ago to replace another one (a giant 60-year-old hollow tree with mistletoe, but inclined to drop branches), is now really established. It’ll be another month before the fruit is truly ripe. I know because I ate them non-stop as I was waiting for Eleanor’s birth. Happy days! 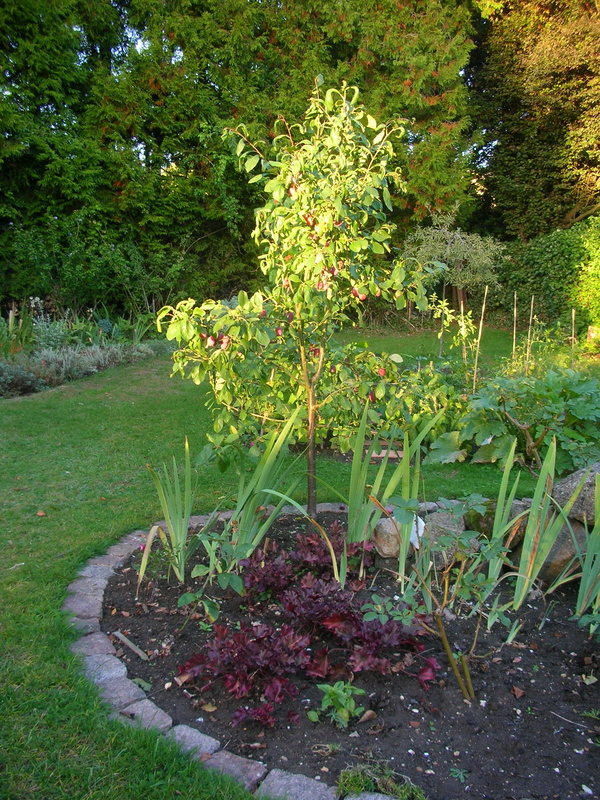 This entry was posted in Gardens and tagged apples, Blenheim Orange apple, Forsythia, plums, Victoria plum by hilarycustancegreen. Bookmark the permalink.